Thank you for choosing what we believe to be the best choice for winter protection for your boat, a Fisher Winter Stoage Cover. We are a small custom boat cover company located in the historic city of Burlington, NJ. 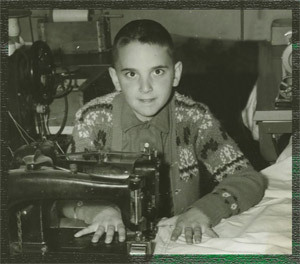 Fisher Canvas Products, Inc. was founded by Fred Fisher in 1991. Fred came up in the boat cover business since he was 10 years old working for his father, Harold Fisher. When the senior Mr. Fisher passed away in August of 1988 Fred and his brother continued to operate the business their father started, Harold F. Fisher & Sons. In the spring of 1991 Fred Decided it was time to strike out on his own and he formed Fisher Canvas Products, Inc. in July of that year. 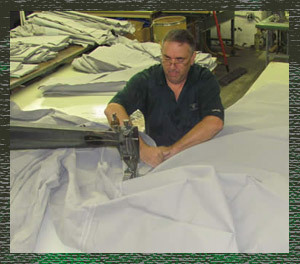 The main stay of the business is and has been Custom Boat Covers for boats. These covers where first made by Fred's dad in the early 1960's. Since that time little has changed except the boats. "We still use cotton fabric, why? Because nothing has come along that can out perform it for durability and longevity." Fred's dad knew, and it has only been proven time and time again, that cotton canvas can out last the more costly synthetics over the life of the cover. "We have customers bringing covers in for repair that are 10 to 15 years old." Not that all covers will get that kind of life, but with proper care and a little common sense it is possible to get 8-10 years service out of one of our covers. What is a Fisher Boat Cover? We would like to introduce our new "New" Standard material, 12 oz Cotton Army Duck* treated with Sunforger**. Sunforger is a finish that is applied to the base material and is Pearl Grey in color. This material is durable, water repellant, mildew resistant and breathable. As with any cotton canvas product, with proper care*** this material will give years of dependable service. As always, we stand behind what we sell. Fisher Boat Covers are warrantied for fit and workmanship for the first year. However, we do not guarantee that our covers will last any length of time. If you follow the simple care instructions, your cover will last many seasons. All Covers have a draw rope in the hem and tie down loops sewn into the hem as well to help hold the cover in place over the long winter. Vents are standard in all Fisher Boat Covers. WeatherMax 80**** is another one of our new materials that can be used for Boat Covers and awnings. It is a high strength and durable solution dyed polyester ideal for year round storage. It is water repellant, breathable, mold and mildew resistant. A great benefit is that this material is about 1/3 the weight of the cotton covers yet still delivers the same protection. We offer this material in silver, beige, and forest green. Do I need to construct a frame? How is the cover supported? Boats with radar arches require a frame constructed to support under the boat cover. We recommend using PVC pipe and we provide a guide on how to make one upon request. For most boats under 35' and without radar arch's, we will install sleeves on the outside of the boat cover for you to slide 2x4's into (The 2x4's should stand on end, NOT lay flat). There are 3 sleeves: 1 in the bow and 2 in the transom. You will want each 2x4 to stick out of the sleeve 6"-1' at each end so it is easiest to guide the 2x4 in and out of the sleeve. Plain 2x4 lumber will do just fine. You do not need to get pressure treated wood. The length of the 2x4's are determined according to the boat. How does the cover attach to my boat? There are pairs of heavy duty webbing loops sewn into the bottom of the cover spaced approx. every 4'-5'. Tie off the right side loop to the corresponding left loop. Each pair ties off individually (don't lace them up). There is also a drawstring sewn into the bottom of the cover that you pull and tie off in the bow. This is for added secureness. We also install grommets in the bow in which you do lace up. Will someone come out and measure my boat? We currently maintain a file of over 6000 custom, hand drawn patterns and are adding to that collection daily. If we have the boat’s pattern on file then we will not need to come out and measure it unless there are added accessories. Details like the location of those accessories and their size will need to be measured so that the cover fits properly. Regardless of our vast inventory of patterns, there are still many types of boats we have not covered before. If the boat is located within our area we will come out and measure it, if it is not then we can send a diagram and instructions so that you can take the measurements. Fisher Boat Covers are guaranteed to fit your boat when they are installed and supported properly. We guarantee the cover to be free of defects in workmanship and materials when you receive it and install it on your boat. A Fisher Boat Cover is not guaranteed to last any length of time. The average life a boat cover is 10 seasons, with proper care. 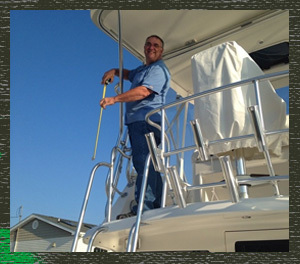 Proper care means that when the cover comes off of the boat, it must be completely dry and stored in a cool dry place. The cover is mildew resistant, but if it is balled up while it is damp, eventually mildew will set in and cause those areas of the cover to become brittle. The cover should also have some sun exposure while it is on the boat. This will allow for proper drying. If rips or damage occurs to the cover, it should be repaired as soon as practical. If you are interested in getting a Fisher Boat Cover for your boat just drop us a line. Our e-mail address is info@fishercanvas.com. Please include the length, make, model and year of your boat. If you can, please include a picture of your boat. Along with the boat covers we make a variety of custom made products for home and industry. If you have a need or are looking to source out a job or product that requires canvas or vinyl material please drop us a line. We have the talent and the equipment ready to be put to work filling your needs. * Army Duck - The highest quality canvas made. Canvas is made by weaving threads together, corsswise and lengthwise. The Army Duck canvas has 2 threads twisted together making 1 thread. These double twisted threads are woven into the canvas going both crosswise and lengthwise. Twisting 2 threads together into 1 makes Army Duck canvas stronger more durable. It also allows the canvas to breathe better. ***Proper care: Make sure the cover is installed properly on the boat and is supported so that water drains off and does not collect and form pockets. When the cover is removed at the end of the season it should be dried and stored in a dry place. Do not store the cover on the ground or directly on concrete. **** WeatherMax 80 is a trademark or registered trademark of Safety Components, Inc.